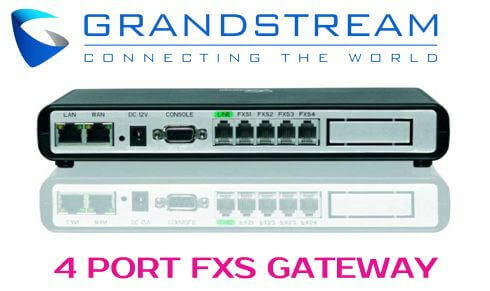 The new Grandstream GXW 4004 4 FXS port gateway lets the user connect analog phones as well fax machines to VoIP systems. As these come with 2 10/100 network port along with integrated router to connect the network and RJ11 line for PSTN Failover. This port gateway also supports 2 SIP-Account Profiles with caller ID for multiple regions or countries. Also, it is also compatible with T.38 fax flexible dialling plans with security protection and voice codecs. It is quite an ideal solution for businesses in need of connecting to one or more traditional PBX lines to VoIP phone. The Grandstream GXW 4004 is designed for businesses in need of connection to one or more lines of traditional PBX to VoIP systems. It comes with 4 or 8 port FX interface for analog systems, dual 10M/100M network ports with integrated Nat router, PSTN Lifeline if there are any events of power failure. Not the mention, there is an RS232 serial port as well for the administration. This FXS Gateway will allow the small and medium business to create integrated IP and PSTN telephony system which will manage the communicate costs, the analog FXS gateway features the ports for analog phone devices with two 10/100 MBPS ports for connecting to the IP Network. The Grandstream GXW 4004 features a built-in NAT Router with advanced telephony features such as easily automated provisioning superb voice. This is combined with PSTN lifeline port that allows this FXS for being the ideal analog gateway solution for businesses today. The Grandstream GXW 4004 features a compact and quite a design, yes it has no fans whatsoever. This allows the device to provide exceptional audio quality with rich in feature functionality. This is further combined with strong security protection for its compelling price. This FXS is an auto-configurable and remote manager. It provides the security protocols of SIPS and TLS along with comprehensive voice codecs. Grandstream GXW 4004 is the next generation IP Voice Gateway, which is interoperable and compatible with all the leading IP PBX. The Softswitch and SIP platforms, this is auto-configurable, scalable and remotely manageable. This system comes with its own dialling plans, PSTN Failover, and integrated call routing features that combine supports the pure IP network call. A key element for small and medium businesses for creating a seamless working environment. All it needs is the user to integrate a traditional phone system in a VoIP network for the sake of managing communication costs.